Located on the internationally renowned site of the National Shooting Centre, Bisley Pavilion is forged in history. 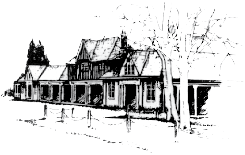 Initially constructed to serve as an Officers Mess by Bovis Construction in 1924, Bisley Pavilion formed the final part of the National Shooting Centres relocation from Wimbledon common in 1889. The change from Officers Mess to the now commercial Bisley Pavilion is unclear, but had definitely started to take place in the 70′s when stars such as Thin Lizzy, Status Quo, Slade, Manfred Man & Emperor Rosco were known to have played at Bisley Pavilion. In 1993, three buildings on the National Shooting Centre site, Bisley Camp, were recognised by Guildford Borough Council as being first in their class for conservation areas. Bisley Pavilion can cater for a vast number of people, with sit down catering for up to 530 people when utilising the four function rooms. In September 1999, Bisley Pavilion opened the doors of it’s new 20 room hotel, which is open all year, 7 days a week. We trust you find this site informative and useful in deciding on the venue and accommodation for your occasion and/or stay. Please feel free to call, fax or e-mail should you have any questions or wish to talk with one of our staff.